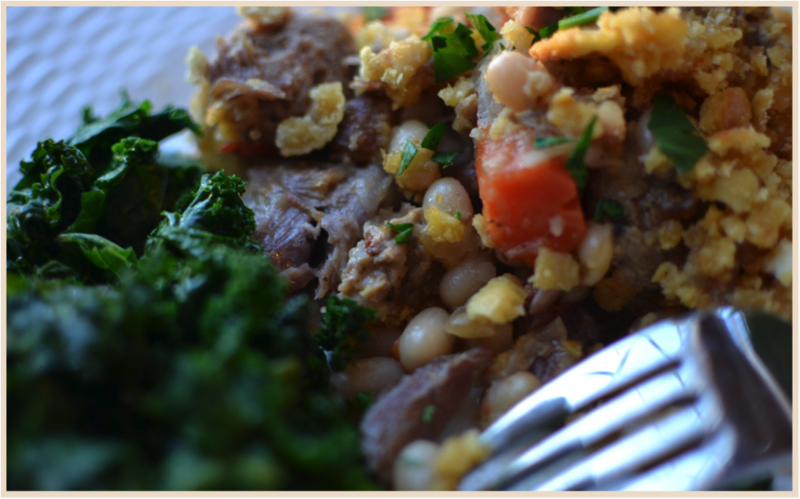 I didn’t set out to create my own cassoulet recipe, but when I started to prep for the recipe I pulled off the internet I soon realized how off the recipe was. I knew it wouldn’t turn out right – the recipe quantities just didn’t add up. It was then that I decided that I would make my own cassoulet. I chucked the internet recipe in the trash, got out my notepad, and started working my recipe. 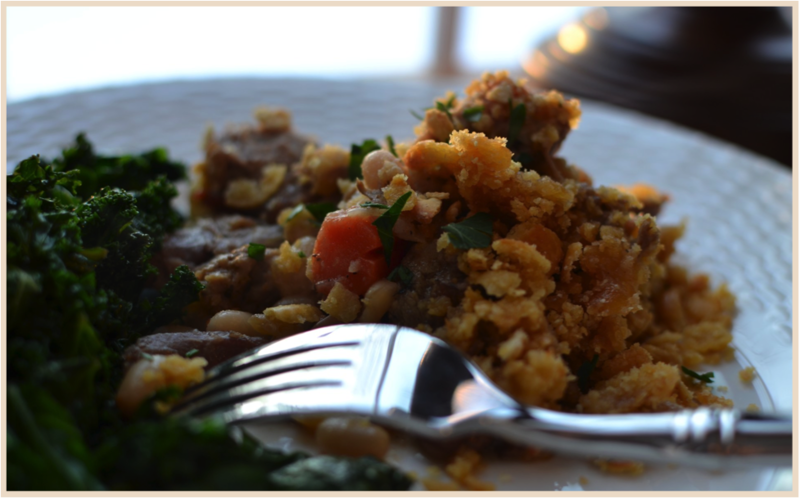 The star of a cassoulet is the duck leg confit. I couldn’t find fresh, local duck legs to make my own duck confit. D’Artagnan sells their packaged duck breasts at small markets and at Whole Foods, but not fresh duck legs. Fresh are nearly impossible to find. And so, after some frustrated sighs, I decided that I would put my duck leg search on hold and start searching for an online source. I quickly found THE duck website: D’Artagnan. They sell hard-to-find game meats, source organic and natural, and they deliver quickly and inexpensively. Perfect. I ordered their duck confit, garlic pork sausage, duck sausage, and duck fat. Shipping only cost $8.95 for my entire order and it arrived packed on ice in only two days. My family loved this dish and I think you will too. I served it with a side of braised kale with garlic. Crumb crust: 1C fresh breadcrumbs (I made mine with crackers) + 1T melted duck fat. Do NOT use store-bought breadcrumbs here. Directions: Soak the Great Northern beans overnight. After 24 hours put the beans in a large stockpot and cover with water at least 3” above the beans. Add 1 tablespoon of salt to the water. Bring to a boil and then lower the heat to medium-high to keep them on a low boil for about 45 minutes. The beans should be tender, but still a bit firm; they will continue to cook in the cassoulet and you don’t want them to fall apart because they were overcooked. Drain the beans, and pour into your cassoulet pan or large Dutch oven. In a large, cast iron skillet, brown the duck and pork sausages in half of the duck fat. Remove the sausage from the pan and add it to the beans. Make sure you scrape off all the burnt sausage bits from the bottom of your skillet – that’s where all the flavor is. Add the grease drippings, too. It will keep your cassoulet moist. Add the diced onion, minced garlic, chopped carrots, diced tomatoes, thyme, chicken stock, and all but 1T of duck fat to the beans and sausage. Place the 4 duck confit legs into the mixture. If the mixture isn’t covered by the chicken stock, add just enough to cover. Bring the mixture to a boil and then lower the heat to simmer. Cover, and let simmer for 30 minutes. After 30 minutes, remove the duck legs and place them on a cutting board to cool down. Keep the cassoulet on simmer while you pick the duck meat off the bone. Return the duck meat to the cassoulet, discard the bones, and continue simmering on low heat, covered, for another 1.5 hours. If the cassoulet looks too soupy, take the cover off while it simmers. The stock will cook down and the flavors will become more concentrated, but be watchful so you don’t let it get dry. After simmering on low heat for two hours on the stovetop, place the cassoulet into the oven with the cover off. Check periodically to see if the cassoulet is getting too dry. If it is too dry, add a bit more chicken stock. Bake the cassoulet for an hour at 375 degrees. While the cassoulet is baking, prepare the crust, and have a well-deserved glass of wine. To make the crumbs, place 2 cups of saltines or chowder crackers in a baggie. Roll over the baggie with a rolling pin until the crumbs are coarse. Pour the crumbs into a small bowl and stir in the leftover tablespoon of melted duck fat. 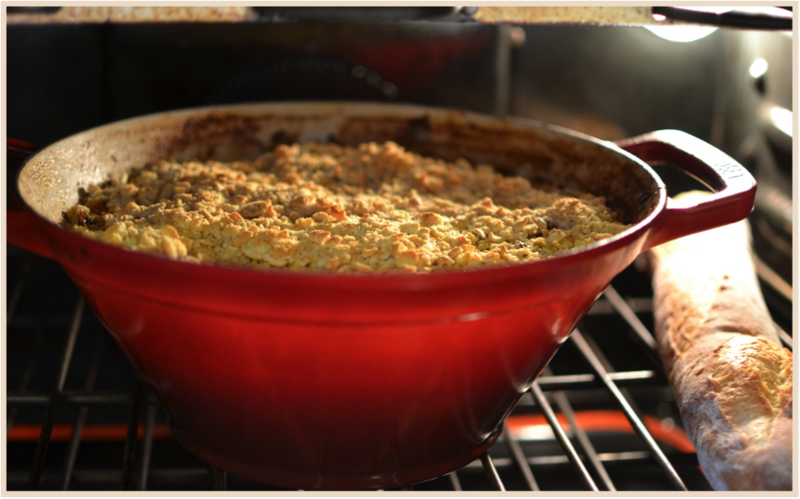 After the cassoulet has baked for an hour, remove it from the oven and top with the crumbs. Bake for another 30-45 minutes or until the crust is a nice, golden brown.